Mel Mangles and ScratcherInTheEye explain a drill. WA Roller Derby skaters went home full of new ideas and skills to practice after a boot camp with visiting Rose City Rollers Mel Mangles and ScratcherInTheEye this weekend. With tips on blocking, footwork and strategy on offer, skaters from WARD, Gold City Rollers, Dread Pirate Rollers, Perth Roller Derby and Perth Roller Derby soaked in all they could over two big days. Mangles and Scratcher were as knowledgeable and friendly as you would expect and answered all the girls’ questions as they put them through their paces. On the Saturday night they joined WARD and fans at a screening of Brutal Beauty: Tales of the Rose City Rollers in Fremantle and answered audience questions ranging from athleticism vs show-womanship to maintaining the passion after the hard yards. Check out the photos from the night on our Facebook page. 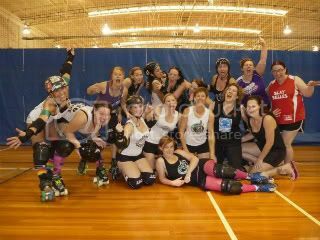 Gold City Rollers with Rose City's Mangles and Scratcher. Great big thanks go to Mangles and Scratcher for sharing their knowledge and to all the WARD girls who made the weekend a big success. The skaters will be full of renewed enthusiasm at training as they work on new techniques, hits and tactics. Check out the Rose City girls’ blog Brutal Beauty Bootcamp Tour for updates on their travels. 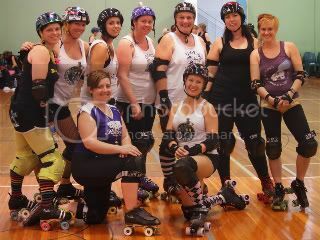 WARD's travel team Wards of the Skate with Rose City's Mangles & Scratcher.